Martin Luther King had one. And so did Marx and Engels. Also John F Kennedy as well as the philosopher Bertrand Russell and scientist Albert Einstein: a manifesto. Many great minds and moments in the past have been fuelled by a manifesto, a published verbal declaration of intentions. In recent years, the manifesto has seen a rise again and there are currently hundreds of manifestos out there – from very famous ones such as the Occupy Wall Street Manifesto , the Holstee Manifesto or Jamie Oliver’s Food Revolution to smaller yet not less strong ones such as the WE SHAPE TECH’s manifesto for women in tech. And now Impact Hub Zürich has one too. At least as a first prototype. A manifesto is first and foremost a very powerful tool to state and present one’s intentions, be it by an individual, group, political party, organization, community or government. The word itself is derived from the Latin word manifestum, meaning ‘to make clear/visible or to reveal‘. In that sense, a manifesto outlines what you set out to achieve. It is your aim or purpose. In its role as being a verbal declaration, it is also an announcement that creates the future you desire. In linguistic terms, a declaration is the opposite of a description. When we describe things we merely note how it appears to us, stating the status quo. Declarations are not descriptive, they are creative and they are aspirational. Finally, a manifesto is something that is shared publicly. Whether that means posting it on the internet for the world to see or sharing it with a group of friends. In either way, you make it available rather than keeping it locked in a drawer. 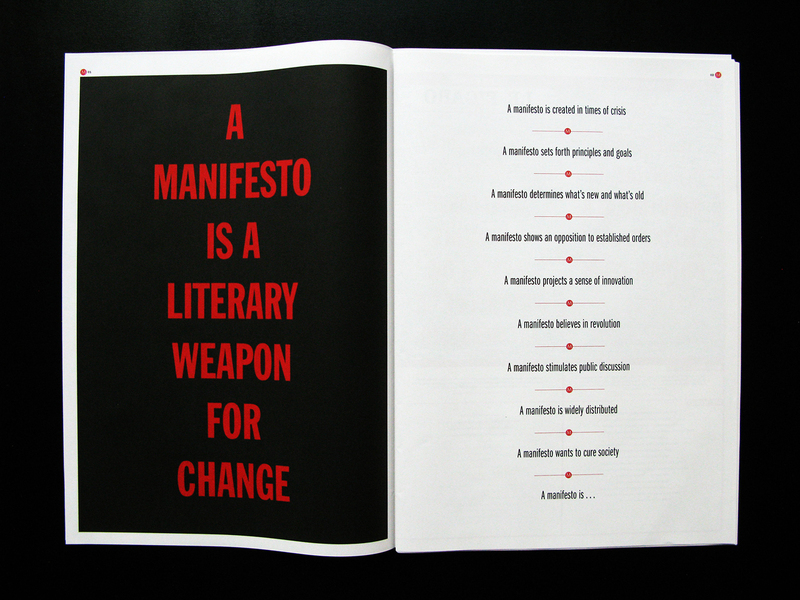 A manifesto is a literary weapon for change! What makes a good manifesto? It conveys a sense of urgency and straight talk. It exists to challenge the status quo. It is living thing and will evolve. These pretty words will stay pretty words until we start living up to them – so we jumped right into prototyping mode. In our last team workshop we came up with a list of concrete action points on how to improve regarding each principle. And we allocated a guardian for each principle to hold us accountable. Over the next 6 months, we will focus on one principle each month to raise our own awareness and start walking the talk. Tackling one principle at a time seems manageable and, honestly, also keeps the amount of work at an acceptable level. We will start in June by focusing on taking care of ourselves and the world, the essence of the “Truly Regenerative” principle (check this article for more info). Marisa, the guardian of this month’s principle, will make sure that we take this seriously and will review our progress at our next Team Assembly on July 6. According to the result of our last team “pulse check” survey, the principles “No Hidden Agenda” and “Failing Forward” are the most pressing ones and will thus follow suit in July and August. In the spirit of No Hidden Agenda, we invite all our members to join our formal General Assembly on June 30, 7-9pm, and get insight into our financial reporting, governance and strategic direction. Send an email to michel.bachmann@impacthub.ch if you’d like to participate to receive further information. Join our next Town Hall meeting on August 25 to hear what and how we are doing and help us figure out how we can live this Co-Manifesto as a community. We look forward to co-develop a manifesto for the entire Swiss innovation ecosystem with you – our members, partners and like-minded organizations. Spread the love with the hashtag #comanifesto and share your thoughts in the comments below! Great v1.0, congrats, I like it a lot!